Turn a property deed or legal description into a plat drawing. Supports many units of measurement. Including: feet, meters, and varas. 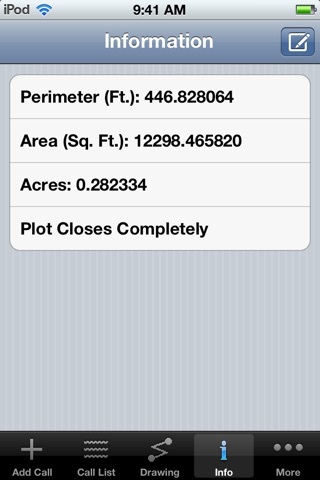 Calculates the area, perimeter and closing error of the plot. Includes the ability to auto-complete a tract if the last call isn't defined. Want to do even more with the plotted tract? Files can be sent and received via email to and from the computer version of Metes and Bounds. 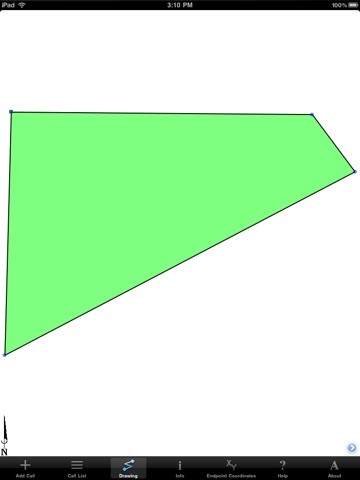 Provides X,Y coordinates for the tracts endpoints. Have some old family land maps from your genealogy searches? Plot them using measurements such as rods, chains and spans. Realtors can use this application to quickly show potential buyers what a piece of property looks like. Please note: Does not support descriptions based on section calls.